^ a b "Northern Ireland Assembly - WRITTEN ANSWERS Friday 15 December 2000". Archived from the original on 23 December 2008. Retrieved 2007-11-19. ^ "Trunk Road Proposals and Your Home". Highways Agency. Retrieved 2007-11-18. ^ "Scottish trunk road network and Transport Scotland". Transport Scotland. Retrieved 2007-11-18. ^ "Transport - Who are we?". Welsh Assembly Government. Retrieved 2007-11-18. ^ "What We Do". Roads Service Northern Ireland. Retrieved 2007-11-18. ^ a b c d "FOI Request - Road numbering". Department for Transport. 2005-08-05. Archived from the original (PDF) on 2007-04-03. Retrieved 2007-12-27. ^ a b "Road speed limits to be reviewed". BBC News. British Broadcasting Corporation. 2007-12-13. Retrieved 2008-01-01. ^ "How the Motorways were Numbered". Pathetic Motorways. Retrieved 2007-11-19. ^ "Q&A: Pounds, pints and the EU". BBC News. British Broadcasting Corporation. 2007-09-11. Retrieved 2007-12-29. ^ a b "Call for metric road sign switch". BBC News. British Broadcasting Corporation. 2006-02-23. Retrieved 2007-12-29. ^ "EU gives up on 'metric Britain'". BBC News. British Broadcasting Corporation. 2006-02-23. Retrieved 2007-12-29. ^ "The Highway Code". Department for Transport. Retrieved 2007-11-18. ^ "133-143:Multi-lane carriageways". The Highway Code. HMSO. Retrieved 2007-11-18. ^ "Introduction". Highway Code. HMSO. Retrieved 2007-11-18. ^ "117-126: Control of the vehicle". The Highway Code. HMSO. Retrieved 2007-11-18. ^ "House of Commons Environmental Audit Committee" (2008-07-22). "Vehicle Excise Duty as an environmental tax" (PDF). "The Stationery Office Limited". ^ "Car tax rules". Directgov. Retrieved 2007-11-18. ^ "UK fuel tax: The facts". BBC News. British Broadcasting Corporation. 2000-09-21. Retrieved 2008-01-05. ^ "M6 Toll (formerly Birmingham Northern Relief Road)". 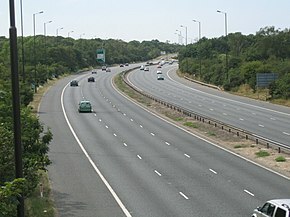 The Motorway Archive. The Motorway Archive Trust. Retrieved 2007-11-18. ^ "Toll road lawyers in award hope". BBC News. British Broadcasting Corporation. 2006-04-09. Retrieved 2007-11-23. ^ "M4 Severn bridge to shut for toll removal". BBC News. 2018-11-19. Retrieved 2019-01-13. ^ Hill, Joanne. "Getting Ahead: Returning Britain to European leadership in road casualty reduction" (PDF). Campaign for Safe Road Design. Retrieved 2008-10-01. ^ "SAFE ROAD DESIGN TO SAVE UK £6BN EVERY YEAR" (Word DOC). Campaign for Safe Road Design. Retrieved 2008-10-01. ^ "Roman roads in Britain". Roman Occupation 43 AD-c410. Channel 4. Archived from the original on 4 November 2007. Retrieved 2007-12-28. ^ a b c d "Timeline of British Turnpike Trusts". University of Portsmouth, Department of Geography. Retrieved 2007-11-18. ^ "The World's First Turnpike". Herts Heritage. Hertfordshire County Council. Archived from the original on 20 February 2001. Retrieved 2007-11-18. ^ a b "Key dates in Land, Road, Building Great Britain 1200-1899". Retrieved 2007-11-18. ^ David Williams. "JONES, JOHN (fl. 1811-1858; 'Shoni Sguborfawr'), Rebecca rioter". Dictionary of Welsh Biography. National Library of Wales. Retrieved 2010-01-12. ^ "Street Tramways". The Times. 1869-05-26. ^ a b "A history of the "motorway concept" before construction began in the UK". Motorway Archive. The Motorway Archive Trust. Retrieved 2007-11-18. ^ "Early Highways: Liverpool-East Lancashire Road A580". Lancashire County Council. Archived from the original on 29 December 2007. Retrieved 2008-01-23. ^ "PROPOSALS FOR MOTORWAY NETWORKS PUBLISHED IN THE 1930's". Motorway Archive. The Motorway Archive Trust. 2007-11-18. ^ "Region: North West - The origins of the motorways of the region". Motorway Archive. The Motorway Archive Trust. 2007-11-18. ^ a b "Statistics". Motorway Archive. The Motorway Archive Trust. Retrieved 2007-11-18. ^ "Trunk roads to get priority in 1970s". The Times. 1969-10-30. ^ "Opening dates for Motorways in the UK in chronological order". Motorway Archive. The Motorway Archive Trust. Retrieved 2007-11-18. ^ "Post-war and beyond". cbrd. Archived from the original on 9 October 2006. Retrieved 2007-11-18. ^ Adams, John (1981). Transport Planning, Vision and Practice. ISBN 978-0-7100-0844-2. Retrieved 2008-11-07. ^ "A road can be stopped" (PDF). Road Block. Archived from the original (PDF) on 16 February 2008. Retrieved 2008-11-08. ^ "Conceptions and early history of the motorways in Northern Ireland". Motorway Archive. The Motorway Archive Trust. Retrieved 2007-12-31. ^ "M1 Belfast to Dungannon and M12 to Craigavon". Motorway Archive. The Motorway Archive Trust. Retrieved 2007-12-31. ^ "Westlink (M1 to M2)". Motorway Archive. The Motorway Archive Trust. Retrieved 2007-12-31. ^ "History and context". Towards a Sustainable Transport System: Growth in a Low Carbon World (PDF). London: Department for Transport. October 2007. ISBN 978-0-10-172262-9. Retrieved 2007-11-18. ^ Kingsnorth, Paul (2003-06-30). "Do we have to set England alight again?". New Statesman. Archived from the original on 2016-09-11. Retrieved 2007-12-28. ^ Webster, Ben (2006-09-11). "Broken promises leave dozens of towns in queue for a bypass". The Times. London: News International. Retrieved 2007-11-18. ^ "Features - Spiritual Places - Twyford Down". BBC Southampton. British Broadcasting Corporation. 2004-03-09. Retrieved 2007-11-18. ^ "1996: Green groups join bypass battle". BBC News - On This Day. British Broadcasting Corporation. 1996-01-18. Retrieved 2007-11-18. ^ "Anti-road protests 'boosted cost'". BBC News. British Broadcasting Corporation. 2006-04-15. Retrieved 2007-11-18. ^ Montague, Simon (1998-07-14). "Better late than never". BBC News. British Broadcasting Corporation. Retrieved 2007-12-28. ^ "PRIVATE FINANCE THE "CENTREPIECE" OF REVISED NATIONAL ROAD PROGRAMME - SIR GEORGE YOUNG". The Treasury. Archived from the original on 7 November 2007. Retrieved 2008-11-08. ^ "Interview with Brian Mawhinney by John Humphrys". BBC. Retrieved 2008-11-08. ^ "Written Questions: National Roads Program". Parliamentary Debates (Hansard). House of Commons. 1994-12-19. col. 874–875. ^ "Head-on collision over transport: The British government has received its sternest warning yet that its unflagging support for the car is seriously at odds with its own green principles". New Scientist. Retrieved 2010-03-11. ^ "M3 Dock Street to Bridge end and Sydenham By-pass". Motorway Archive. The Motorway Archive Trust. Retrieved 2007-12-31. ^ "UK Politics - More than 100 road schemes shelved". BBC News. British Broadcasting Corporation. 1998-07-31. Retrieved 2007-11-18. ^ "UK Politics - Road scheme details in full". BBC News. British Broadcasting Corporation. 1998-07-31. Retrieved 2007-11-18. ^ "What are Multi-Modal Studies?". Multi-Modal Studies. Highways Agency. Archived from the original on 26 December 2007. Retrieved 2008-01-01. ^ "Chapter 3 - Integrated Transport". A new deal for transport: better for everyone - white paper. Department for Transport. Archived from the original on 2010-03-03. Retrieved 2007-11-18. ^ "Select Committee on Transport, Local Government and the Regions Eighth Report". House of Commons. Retrieved 2008-01-16. ^ "Direct action road protest veterans delegation to Dept for Transport". indymedia. Retrieved 2008-01-13. ^ Grice, Andrew; Russell, Ben (2008-06-24). "Not in our backyard! A Bill that threatens historic right to protest". The Independent. London. Retrieved 2008-11-08. ^ "Planning bill could fast track environmental harm". RSPB. 2007-11-07. Retrieved 2008-11-08. ^ Murray, Louise (2005-10-26). "Smooth-flowing traffic is on the way". Society - The Guardian. London: Guardian News and Media Limited. Retrieved 2007-12-31.